Welcome to Dolphin View Cottage, Ardersier on the Moray Firth - A place to enjoy nature. OFFER - 9 nights for the price of 7 for holidays taken during between 1st November 2019 and 22nd December 2019 & 10th January 2020 to 28th February 2020. Please click tariff page for this and other special offers. Dolphin View Cottage is the ideal base for a dog friendly self catering holiday cottage on the beautiful Moray Coast. Dolphins can often be seen from nearby Fort George which is a lovely gentle walk from the cottage along well maintained and surfaced paths. The picturesque seaside village of Ardersier lies between Inverness and Nairn overlooking the Moray Firth and Chanonry Point. Only 10 miles from the Highland capital, Inverness, and 7 miles from Nairn, famed for its fine beaches and championship golf courses. Close proximity to all Moray's Golf Courses and only 3 miles to Castle Stuart Golf Course. Excellent bird watching: ospreys, red kites, waders and sea birds. Shingle beach ideal for picnics, barbeques, kite surfing, paddling, canoeing - concrete steps opposite the cottage - ideal to launch your canoe. Slipway further along the shore path. The cottage is well placed to be the perfect base for all the attractions the Moray Firth and Highland have to offer:- Dolphin Trips, Loch Ness, the Castle Trail, the Malt Whisky Trail, the Speyside Way, Cawdor Castle, Glen Affric, Findhorn Foundation, Skiing at Aviemore and the Lecht: A perfect year round location. 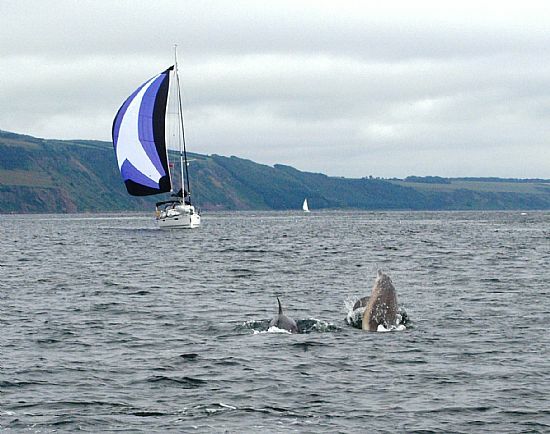 Dolphin View Cottage is well insulated and provides modern comfortable accommodation. For more information about the cottage please click here. Dolphin View Cottage is available for weekly let from Saturday to Saturday, prices range from £380.00 to £500.00 per week. Perfect for couples. Short breaks or longer stays may be available out of season. Please see our tariff and availability page for full details. Dolphin View Cottage, Ardersier a home from home with a view!